Normally I have big answers on this website or at least I try to dispense the approach I have gained over the many years on this great planet. Either through a natural chemical makeup or a psyche that operates on “happy mode” most of the time, I figure I can share my framework with folks, in an effort to give back and provide joy. But now with one of my kids are leaving I’m facing a new challenge and uncharted waters. Most disturbingly, I’m not sure my normal happy-wisdom thing is going to work. At the core of Happy Wisdom is the iteration of the SPARC process. Sparc-ers go through Situation, Possibility, Action, Renewal, and Collection. We iterate over each of those, weekly, and you get things done that matter, without burning out. But does SPARC help you when your heart is under attack? When the rug is getting pulled out from under you, what good is iteration? I can’t iterate my son leaving. I’m sitting at my kitchen table eating mixed nuts from Costco and thought I’d maybe ask the world for advice since I’m not sure how we’re going to handle my boy leaving. This is definitely nervous eating, but since I’m on Keto I can’t really gorge myself on ice cream and pizza. Pamela Druckerman in her new book, There are No Grownups, says by middle age we’ve lost and gained the same ten pounds so many times we treat its return like an old friend coming to visit. 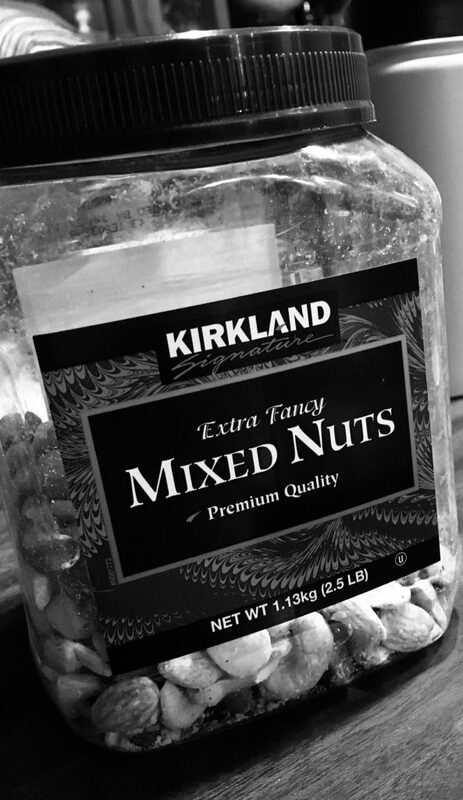 So Mixed Nuts it is. They’re extra fancy. It’ll be fun. Teenage years are a tumultuous time. You wrestle with them as they find their way and you push and they push. It’s healthy tension – both sides learn, and we all grow. At the end you feel like you’ve mastered the Art of Teenager, or at least that teenager. Eighteenish years and you’ve made it! Double-bonus points if you’re all still talking to each other! Congrats! You get to say goodbye. This is something millions of people have gone through and are going through now. There’s help out there, but no answers really. Over at Mind Body Green, Louise Jensen has a great article, emphasizing some of the positives ( lower food bills, more time), but even there she laments the change of identity and the radical change to the family dynamic. There’s a good article by the Guardian about the seriousness of “empty nesting” and how there’s even a hotline dedicated to it. From what I can tell, there’s no real mastering of this part of life. It’s the part of letting go, of loss, of life taking away that which it gave, nay, lent to you. I can eat all the Mixed Nuts I want, but that’s not going to stop time. Now, for a bit of detail into the situation – my son is going on a mission trip for six months minimum to a remote location in Canada. You can follow his journey here. I might get him back for a bit after that, but the die is cast. The process has begun. My eldest daughter still lives here, thanks to God and insane property values, but her ownness has been nonetheless palpable. She is really on her own. However, there’s something about the pending “driving away moment”, without my son in the car, that, to put it lightly, will present uniquely intense emotions. I hae eighteen days to get ready for that moment. Somehow. See, I’m not a cryer. Ask anyone. But this one might get me, and I know that’s okay and whatever. And yet being sad is not me, it’s not how I choose to live. I’m a yellow, sunshine, and possibility; not despair, loss, and melancholy. So here’s what I’m going to try. I’m going to try to stick with the SPARC system, even use the little notebook. Every week. I’m going to find generative activities and accomplishments to do. I’m going to stay busy, which is one of the most common recommendations. It’s helpful that I have one more kid who depends on me and my wife. But even that young one will leave, and then I’ll be out of tax deductions and Mixed Nuts. My chosen role is one of strength. I’m going to allow myself to be sad, but try to be buoyant for my wife and the remaining family. This is where faith comes in handy. We are visitors here. The unrelenting impermanence of everything here is foreign. Our lives are adding up to something big, but to try to hold onto anything here is a fool’s errand. Letting go is an advanced skill on this temporal, entropy-burdened reality. For now, though, I’ll take all the advice the Interweb can offer. What has those who have gone through this sort of departure done to cope? I have a few cashews left, enough to get me through my fifth reading of this poem. Enjoy?